Backcasting is a process of starting from a vision of success, then looking back to today to identify the most strategic steps to get achieve success. 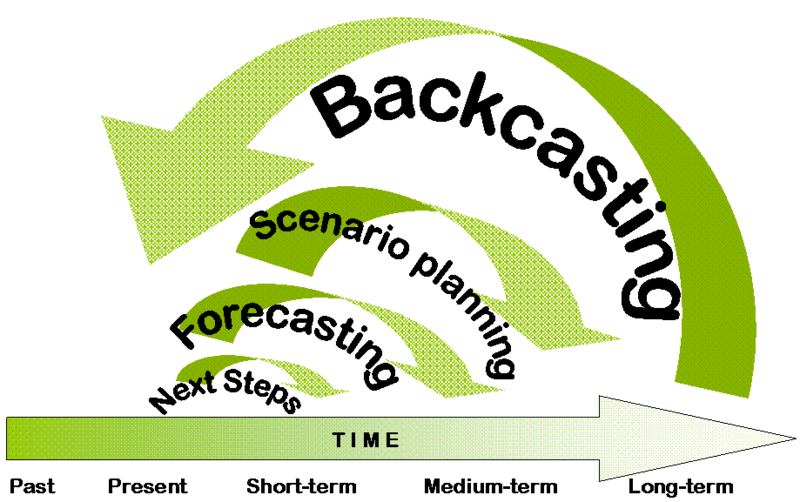 The process is described here, compared against forecasting or use of scenarios in planning processes, and examples of applications provided. Many individuals, organistions and teams will start work with no clear, shared purpose. In every situation there is a way to get clear on an agreed vision of success to which all efforts can be directed. In fact, the more uncertain the future, the more likely your action are likely to influence or create that future, the more important if is to ‘backcast’. 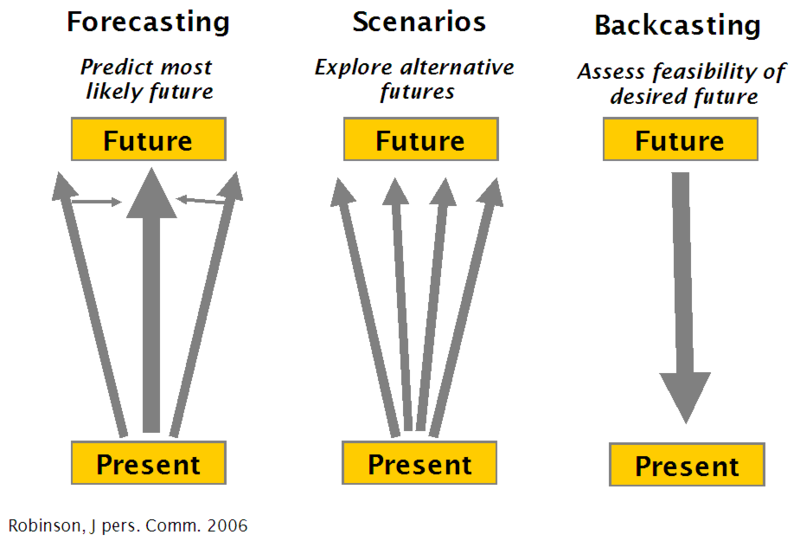 Backcasting is used to describe the future scenario you would like to head towards, and assess its feasibility. This is usually a long-term exercise, in terms of business planning – setting 1, 5 and 10 year goals. Because there is often greater uncertainty and less control over what may happen in longer time frames, the future vision may usefully be defined using principles rather than specifics. Backcasting is an opportunity to let go of the current reality for a moment and freely imagine what might be possible. A typical backcasting question is “How would you describe ‘wild success’ for yourself in 2012?“. The description of ‘wild success’ may be in the form of principles, felt emotions, ‘SMART’ or ‘Well-designed’ goals or outcomes, a narrative story (download a pdf on these approaches to a vision well-designed-outcomes_updated), or even an image (e.g. visual facilitation, like this or this). Which to use for your circumstances? Distinguishing between, and consciously engaging ALL these perspectives through any planning process is VERY important. Often individuals, organisations (or even society) can mistake one for the other. This can, for example, mean people artificially restrict what they imagine is possible in the future, forgetting the future is yet to be co-created! Or, it can mean people get obsessed with next actions without considering how aligned they are with what they ultimately want to achieve. In the specific case of sustainability, many organisations undertake the first steps but lose motivation because there is no explicit, shared vision of success. Similarly, some organisations have lofty visions, but are unable to use that to guide their next steps. The desired future is to be a sustainable business with three outlets by 2012, which will mean the owners can be taking a less hands-on role in the business. One scenario of how they might grow is to focus on sales to a nearby suburb with a growing percentage of wealthy, young professionals. The current business financial forecast is based on past trends in profitability, and shows that their may even be the resources to expand into a second store next year. The owners decide on the next action of visiting that suburb on the weekend, as the first step of market research. I have used these techniques consistently with established organisations, teams, entrepreneurs, and individuals in coaching sessions. There are a range or associated tools and techniques that can make the ‘backcasting’ experience and application very powerful, including experiential workshops like the ‘Future Room’. Backcasting from principles is the primary context in which The Natural Step Framework, and Strategic Approach to Sustainable Development becomes so powerful. Hi Andrew, thanks for the link to our work at Delta7. Interestingly, our experience shows that clients often really struggle to visualise a future state, and when they do, the image is often not as engaging as a depiction of where they are now. One reason, I suspect, is that the future state often represents a situation which they have no lived experience of; whereas the current state pictures point to experiences they’re intimately connected to and which have real meaning. Nonetheless, it’s crucial to create what the McLeod report on employee engagement called a ‘strategic narrative’. That’s more than just a vision of the end state, it’s a fuller story about the case for why change is happening and the part people play in it. Hi Sam, thanks for your comment. There is also an interesting dynamic where you can substitute leaps in depth for temporal leaps. That is, if you create a context in which people can be honest, authentic and get in touch with the deepest hopes (and fears) NOW, then that is similar to what they would articulate for a desired future. That is ‘heaven’ or ‘sustainability’ is present now if you look hard enough, it’s just we tend to project it out into the future, and ‘out there’ somewhere. I mention that because although visioning, backcasting and strategic narratives are great, one of the primary drivers for engaging in those exercises is such that people make very different decisions NOW. Too many times you can run these exercises and individuals can walk out of the room convinced by the vision, but when asked can be adamant that they will not fundamentally change anything about what they are doing now! Co-creating the vision such that it becomes part of the shared language and symbols of a community or organisational culture can help, and there still must be that real commitment to change (which must be preceded by acknowledgment that there is actually something terribly wrong with how things have been done up to the present! ).